Over years of hosting friends for Saturday lunch, frittata has become a staple of my lunch table. It's easy to prepare; it makes use of whatever of-the-moment ingredients you have in the fridge or on the counter; best of all, if you're preparing it in the Italian style, it's served at room temperature. Unlike Tortilla Española, which stacks up nice and high, thanks to a hefty load of sliced potatoes inside - frittata is supposed to be thin. I've made it with tomatoes and feta; with kale, spinach, or other greens; with squash blossoms and/or zucchini; or with whatever else I have on hand. We're talking eggs, seasoning, and vegetables. It's pretty hard to screw up. But a few weeks back, my in-laws were in town, so I went in search of something to make the frittata extra special. That's when I stumbled (literally - I almost knocked the whole thing over while reaching absentmindedly for flour) across a bowl of caramelized garlic, syrupy and soft and deeply browned, which - of course, you already know this - were the perfect addition to my frittata. Backing up: I'd caramelized garlic to make Yotam Ottolenghi's caramelized garlic quiche. (I'm sorry, I've been hitting you over the head with Ottolenghi recipes - are you sick of him yet? Are you sick of me obsessing about him yet? Don't be; buy his book and you'll see why I can't stop.) But then I got sidetracked with mini lentil galettes and beet salad with walnut sauce and a really good blueberry tart, and that garlic quiche? It never happened. Kismet, I tell you. Can I just spend a couple minutes telling you about this garlic? Because it is amazing. It's the kind of thing you make and then want to use in everything, on everything. Shmeared into hot sourdough bread, tucked around a block of feta and baked until sizzling, or - yes - sneaked into your mouth by the spoonful as you pretend to use it for an actual dish. It's fragrant with thyme, sweet from the sugar and balsamic vinegar. And it's as tender as if it had been braised. On paper, it sounds like the kind of special ingredient that makes everything better. In reality, it does just that. To echo the garlic's sweetness and give the frittata texture, I added some fresh corn. And because I really can't help myself, I added a few generous spoonfuls of fresh chevre. I wanted to add garlic scapes, but I couldn't get any, so I added a scallion instead. I may have also stirred in some basil. In retrospect, none of this was necessary. Corn, goat cheese, and garlic are all this frittata needs. The simpler, the better. 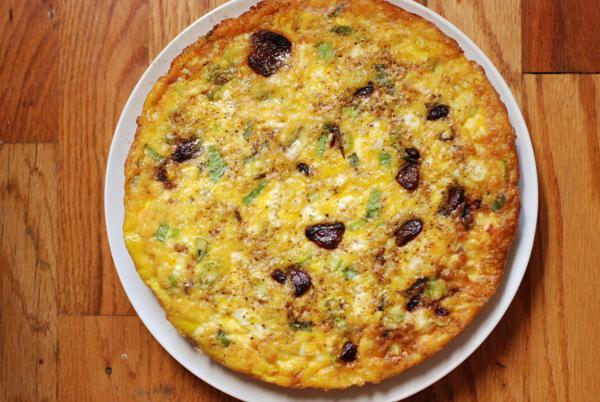 This frittata will take us right from summer into fall. When corn is gone, I'll make it with mushrooms. Or maybe I'll really make like an Italian and stick to eggs and that perfect, sweet garlic. Sounds like simple perfection to me. Put the garlic cloves in a small pan and cover with half a cup of water. Bring to a simmer and blanch the garlic for 3 minutes, then drain well and dry the pan. Return garlic cloves to the pan and add the olive oil. Fry the garlic on high heat for 2 minutes, shaking the pan to fry each side of the cloves. Add the balsamic vinegar and 1 cup of water and bring to a boil, then lower the heat and simmer gently for 10 minutes. Raise the heat to medium. Add the sugar, thyme, and a pinch of salt and continue simmering for 10 minutes, or until most of the liquid has evaporated and the garlic is covered in a dark caramel syrup. Set aside. In a medium mixing bowl, whisk the eggs with salt and pepper to taste until well combined. Fold in the lemon zest, corn, and bits of goat cheese. Set a large saute pan over medium heat and add the butter and olive oil. When butter has fully melted, swirl the pan to coat the sides. Pour egg mixture into the pan, swirl to distribute evenly, and sprinkle the garlic cloves over the surface of the frittata. They should sink into the egg mixture almost immediately. Transfer the pan to the oven and bake until frittata is set, about 8 minutes. Let cool for 10 minutes before trying to remove the frittata from the pan; the hotter it is, the more easily it sticks.